SQL Server query plan cache – what is it and why should you care? What is a query plan? SQL Server like all databases goes through a number of steps when it receives a command. Besides parsing and validating the command text and parameters it looks at the database schema, statistics and indexes to come up with a plan to efficiently query or change your data. You can view the plan SQL Server comes up with for a given query in SQL Management Studio by selecting Include Actual Execution Plan from the Query menu before running your query. DBAs know the value in hitting the query plan often and this is one of the reasons they like stored procedures. You can however achieve the same thing with parameterized queries providing the query text and the parameter definitions are identical so you can execute the same thing over and over again just with different parameters. If your ORM uses parameterized queries then it too can take advantage of it but it is important to remember the query definition and parameters need to be identical for this to happen. In .NET 3.5SP1 both LINQ to SQL and Entity Framework did not set the length of variable type parameters (varchar, nvarchar, text, ntext and varbinary) so SQL Client sets it to the actual content length. This means the cache is often missed and instead populated with plans that are different only in the parameter lengths. In .NET 4.0 variable length parameters now honour the defined length in both LINQ to SQL and Entity Framework where possible or fall back to the maximum length when the actual content doesn’t fit in the defined length. My multiple outputs from t4 made easy post contained a class making it easy to produce multiple files from Visual Studio’s text templating engine (T4). This helper class forms the basis of multiple file output for Entity Framework templates in .NET 4.0 and the LINQ to SQL templates on CodePlex so we (Jeff Reed, Andrew Peters and myself) made the following changes. The header, footer and file blocks can now be completed with EndBlock (EndHeader and EndFooter are gone), although it will automatically end the previous block when it hits a new one or the final Process method. Files are now only written to disk if the contents are different with the exception of the original T4 output file (we can’t stop that, sorry). There is additional overhead reading and comparing files we believe unmodified files keeping their dates and source control status are worth it. When the template detects it is running in Visual Studio and that the file it needs to write to is currently in source control but not checked out it will check the file out for you. All files that were not part of the generation process but are nested under the project item will now be deleted when running inside Visual Studio. Outside of Visual Studio files are no longer deleted – this was destructive and it couldn’t know which files it generated on a previous run to clean-up correctly anyway. Visual Studio has both web sites and web applications with the former being project-less leading to very messy multi-file generation so it forces single file generation. Source is now simpler to read and understand with less public visibility and faster and more robust VS interop by batching the files & deletes to a single invoke at the end to avoid conflicts with other add-ins that might be triggered by the changes. Many templates need to share a common header/footer for such things as comments or using/import statements or turning on/off warnings. Simply use StartHeader and StartFooter and the blocks will be emitted to the start and end of all split files as well as being left in the original output file. At the end of the template call Process to handle splitting the files (true) or not (false). Anything not included in a specific StartNewFile block will remain in the original output file. I fired up Visual Studio this evening to write a proof-of-concept app and found myself wanting strongly typed domain objects from a database but without the overhead of an object-relational mapper (the application is read-only). So for any DbCommand object you can turn it into a bunch of classes by specifying the new pattern. 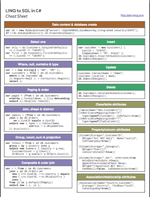 A few short words to say I’ve put together a cheat sheet for LINQ to SQL with one page for C# and another for VB.NET.